It’s that time again! Always on the first weekend of September, rain or shine, the gigantic flea market starts tonight in the northern city of Lille. Lucky for us, the weather forecast for this weekend is sunny and warm. One million visitors from all over the country and from neighboring Belgium, Germany and the U.K. descend on Lille which transforms its city center into a giant pedestrian zone. To give you an idea of previous flea markets, here are two links from previous years (lots of photos.) When I return Sunday night, I’ll post new photos from this year. Once in the bookstore, I wasted no time going out again because the evening light was so beautiful. 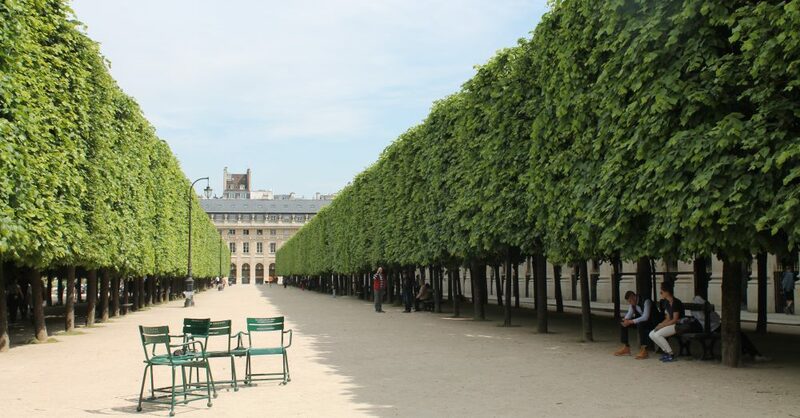 Across the road, the Tuileries Gardens beckoned. I went into the gardens and took these photos at the Round Pond. What is it about water that soothes and mesmerizes us? Actually, I know the answer to that question. Because water reminds us of where we came from. It invokes a feeling of connection to something or someone beyond ourselves. 7 pm on a weekday, an oasis in the middle of a chaotic, jarring (and terribly polluted) metropolis. Sadly, the noise and air pollution in this city has become intolerable. Have you ever seen Parisians so relaxed? Or maybe they weren’t Parisians at all. It’s still August and the city is jam-packed with tourists. The air temperature was a perfect 25°C (77°F). The last of summer before autumn arrives. But I love autumn, so I’m looking forward to September and October. Here’s the rue de Rivoli where W.H. Smith is located. The Tuileries Gardens are directly opposite (metro Concorde). And here’s the entrance into the gardens from the Place de la Concorde. Summer is rosé season … and we are spoiled for choice here in France. Sometimes I’ll stand for ten minutes in front of the rosé wine section at my local supermarket, deciding which region to choose. Corsican? Provençal? Languedoc? The Bordeaux region? They’re all good. Bordeaux Clairet is a distinctive rosé from Bordeaux, so deep in color it might almost be mistaken for a lightly-colored red wine. As might be expected, it’s made using the classic Bordeaux red-wine varieties – predominantly Merlot with a little help from the more “serious” Cabernet Sauvignon and Cabernet Franc. Despite their intense color and rich fruity scent, the wines are always dry in style. Typing the word ‘Merlot’ reminded me of that funny scene in the movie SIDEWAYS. If you haven’t seen this movie with Paul Giamatti, I highly recommend it. Here are a few simple plates I threw together for a friend who came over recently. It was during the heatwave, so we ate cold. That cheese is halloumi … a Cypriot brined white cheese; so so good, grilled or cold. I’ve been making this salmon dish for decades, it’s so tasty. Marinate salmon in soy sauce, sesame oil, fresh ginger, scallions, garlic and a drizzle of honey. Place in a foil-covered baking dish and oven bake at a low temperature. Delicious hot or cold. The star of the meal was a big bowl of quinoa-bulgur; I forgot to take a picture of it. Too bad because it’s really colorful. At my local supermarket you can buy a box of quinoa-bulgur already mixed. Once you’ve boiled it for ten minutes then drained it, throw it into a large bowl and add a chopped red and/or yellow pepper, tomatoes, cuke, red onion or scallions, dried cranberries, and fresh chives or any other fresh herb (parsley, coriander.) Optional additions are cut-up chunks of mozzarella or halloumi cheese, cut-up black or green olives, and sun-dried tomatoes. But the best addition is corn: not from the can, but kernels sliced from the cob. You can also add grilled chicken breast cubes or, alternatively, serve with grilled, turmeric-rubbed chicken on the side. Then I make a lemon juice-olive oil-vinegar-garlic vinaigrette and spoon it on at the last minute. I’ve been eating this salad all summer long, it’s a meal in itself. Serve with a chilled white or rosé wine. And last but not least, here’s my new IKEA wardrobe. I’m so happy with it. It takes up nearly an entire wall. Who doesn’t love IKEA? I bought these ceramic door knobs separately at Zara Home. The weather was so perfect I wanted to preserve it in a bottle: cobalt-blue sky, blazing sun and a cool breeze blowing in from somewhere. Impossible to stay indoors! So I jumped on the metro and crossed town to my favorite large park in Paris. I make only one change on the metro, from the number one central line to the number 14 line. There are two metro stops that serve the Parc de Bercy, one at either end: Cour Saint-Émilion which takes you directly to Bercy Village, and Bercy, at the far end of the park. Personally, I prefer Bercy because it allows me to walk through the elongated, beautiful park that runs parallel to the river Seine. Bercy Village is located at the end of Bercy Park (metro stop Cour Saint-Émilion on the number 14 line.) Tastefully designed and spread out along a single pedestrian street, it houses an even number of shops and restaurants. It’s what I call a “feel good” place. Here’s a favorite shop of mine. Fragonard sells gorgeous soaps, bath products, body creams as well as clothes, jewelry and a few home furnishings. If you’re looking for gifts, this is the place to go. It’s also beautifully air-conditioned. Their signature glycerine soaps cost 5 euros apiece. I bought a green one (Verveine which is lemon verbena). I also bought a gift box of four jasmine soaps for only 12 euros per box. The prices at Fragonard are reasonable, the quality excellent. Another legend gone. And no-one to fill her empty shoes. Here in Paris, they’re playing Just for a Thrill on the radio stations, a classy little number from 1962. Adieu, Aretha. Que vous reposez éternellement en paix. An 11-year old boy loses his mother and siblings (and nearly his leg.) He and his father start a new life in Winnipeg. A heart-wrenching story.